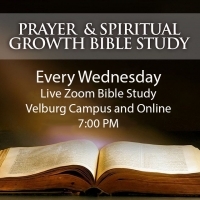 You are invited to join us for our Wednesday night Zoom Bible Study at 19:00 Central Europe Time either live at the Velburg Campus, or by Internet using your computer, smartphone or tablet. To join by the Internet, you will need to have a good Internet connection, and depending on if you are using your computer or mobile device, you will need to download a small program or app. This service is through Zoom and has full HD video and voice. In order to join the Bible Study, you must complete a One Time Registration by clicking on this link. Please make sure you have completed the One Time Registration here. When it is time to join the Bible Study, open your web browser and got to https://zoom.us/join. You will be prompted to enter the conference code. The code is: 671-131-824. You will be asked to install the Zoom browser client the first time you join. If you have a problem, you can go here to install the client. When you are connected, you will see a button to turn on your webcamera and a button to mute your microphone. The default setting is for your microphone to be muted when you connect. In order to be heard, you will need to unmute your microphone. During the Questions and Answers part of the Bible Study, your microphone will be muted automatically and there will be a button "raise hand". Press this if you have a question or answer and the moderator will unmute your microphone so you can be heard. This avoids any background noise from open microphones or too many people trying to speak at the same time. If you are planning to use your smartphone or tablet, you can download an app called "Zoom" from the Android or Apple App stores. Once you launch the app, you will be given an opportunity to enter the conference code. Please enter 671-131-824. This will connect you to the confenence. We look forward to you joining us for this wonderful way to connect people from all around the world for a virtual Bible Study!